The United States spends twice as much as other industrialized nations on health care but performs worse on many population health outcomes. While this spending is primarily the result of pricing and administrative costs, it is also a consequence of non-medical factors influencing the health of the population. These non-medical factors, often termed social determinants of health, are defined by the Centers for Disease Control as “the complex, integrated and overlapping social structures and economic systems that are responsible for most health inequities.” These factors can include, but are not limited to, the economic, environmental and educational context of individuals. This Issue Brief focuses on food insecurity as a social determinant of health, and examines the opportunities to improve related health outcomes through policy in Ohio’s Medicaid program. Food insecurity is defined as the inability to afford nutritionally adequate and safe foods. Research indicates high levels of food insecurity are associated with poor health outcomes. This association begins at childbirth where food insecurity has been linked to lower birth weight and, later in a child’s life, insulin resistance and glucose intolerance. These are conditions which significantly increase a child’s risk for chronic disease. Furthermore, food insecurity has been shown to affect key developmental milestones, with connections to behavioral problems, school absenteeism and poor academic performance. These outcomes are associated with household food insecurity, suggesting that the impacts may not be entirely mitigated by more child-specific efforts such as the National School Lunch Program. Food insecurity has been shown to affect key developmental milestones, with connections to behavioral problems, school absenteeism and poor academic performance. In addition to the impacts on children, food insecurity is associated with an increased incidence of chronic disease, nursing home admissions and higher rates of diabetes-related hospitalizations, all of which are linked to disproportionately high Medicaid spending. When access to nutrition-based case management is made available, these trends are reversed. In a 2013 study looking at the intersection of nutrition assistance and Medicaid expenditures in Philadelphia, data indicated greater assistance led to decreased inpatient costs, shorter lengths of stay and fewer hospital admissions. This success was achieved through a combination of services like home meal delivery, nutrition education and counseling. These services, in turn, enabled individuals to maintain a healthy body weight, manage nutrition-based chronic diseases such as diabetes and hypertension, as well as better manage their care after a hospital discharge. Food insecurity is associated with an increased incidence of chronic disease, nursing home admissions and higher rates of diabetes-related hospitalizations, all of which are linked to disproportionately high Medicaid spending. Policy experts recognize the important connection between food insecurity and health. In 2017, the Health Policy Institute of Ohio (HPIO) released the “Health Value Dashboard,” a tool that compares Ohio to the rest of the United States in outcomes and costs related to health care. This document highlights food insecurity as a major challenge, ranking Ohio 45th out of 50 states. Additional evidence from this review shows that 16 percent of Ohioans live in food insecure households, including nearly one out of four children and one out of five seniors. As a part of this review, HPIO recommended policies which increase access to food and prevention services for individuals at risk for nutritional diseases. Beyond these policy options, this document highlights potential policies related to the Supplemental Nutrition Assistance Program (SNAP), the most significant programmatic tool used in addressing food insecurity. SNAP is an effective tool for reducing poverty, decreasing food insecurity and controlling costs in health care. Research indicates SNAP has reduced household poverty by 4.4 percent, with the most significant reduction for children at 15.5 percent. This effect is pronounced for households that access the benefit versus those that do not. Long term, data shows kids are more likely to be economically self-sufficient later in life when they receive SNAP benefits. With reductions in poverty and insecurity, families tend to be healthier and incur fewer medical costs than those who do not take advantage of the benefit. In addition to children, it is worthwhile to note that the SNAP participation by seniors in Ohio is very low. Given the projected population growth of this demographic and the related budgetary stress this shift will cause in Medicaid, this should be further researched. However, despite the cost and outcome benefits of SNAP in regards to health care and population health management, access to the program has been considerably curtailed, with pantries likely now providing services where government once had. Data from the Ohio Public Assistance Monthly Statistics (PAMS) report has shown a decrease in the number of eligible participants in SNAP. This is the result of a 2013 shift in food access policy when individuals without dependents or disabilities (known as Able Bodied Adults Without Dependents or “ABAWDS”) enrolled in SNAP were required to register for work to comply with the Food Assistance Employment and Training (E&T) program. Although the number of unemployed people decreased by about 129,000 between August 2013 and October 2017, SNAP disenrollment was nearly 370,000. This is most likely the result of the imposition of work requirements on individuals who, when they failed to meet the administrative requirements of the new policy, were sanctioned and their benefits were removed. The data from Figures 1 and 2 was collated by PantryTrak, an online client intake data management system developed for emergency food sites and the US Census Community Survey. Building on the data linking the utilization of SNAP by older adults through PantryTrak, the Food Bank surveyed senior communities in Indian Hills and St. Clair Place Apartments. In both of these surveys, many respondents indicated they made trade-offs between food, transportation, medical care, utilities and rent. This local data reinforces the data from Franklin County, and national literature, indicating a causal link between food insecurity, economic stability and medical outcomes. Medicaid programs across the country have started to recognize the connections between food and medicine and are starting to develop infrastructure to improve outcomes. The National Quality Forum (NQF), an organization created to promote delivery system quality through measurement and public reporting, often inform state and federal governments’ policy decisions in regards to evidence-based approaches to improving care. In a recent report, NQF reviewed a number of states’ approaches to addressing social determinants through Medicaid. This review includes a myriad of conclusions and recommendations, but a few themes emerge. First, states have leveraged their 1115 demonstration waiver authority to experiment with Medicaid as a financier of social determinant work. In Massachusetts, the Medicaid program links claims data, encounter data from Managed Care Organizations (MCOs) and other state agencies, to risk adjust their pay for performance program. In states like Pennsylvania, Oregon and Illinois, the state government has created consumer-oriented tools to combine benefit management between programs like SNAP, Medicaid and Temporary Assistance for Needy Families, as well as developed inventories of available community resources like affordable housing and emergency food. These types of efforts allow providers, case managers and patients to coordinate needs beyond those which are singularly medical. While the Ohio Department of Medicaid has made recent efforts to consolidate its eligibility systems, like the work cited above, that project is ongoing and there is no specific policy outlining how that integration will intentionally address food insecurity. …many respondents indicated they made trade-offs between food, transportation, medical care, utilities and rent. Several Ohio MCOs are implementing programs to address the food insecurity of their members. United Health Care, for example, distributed an assessment to some of its highest risk patients to determine if they were using any community resources such as Legal Aid or SNAP. This information helps the MCO case manage some of their most needy members and, as reported by the plan, has facilitated the access of services to improve nutrition-based diseases. This effort is coupled with the use of mobile applications (apps) such as “Healthify” and “Fresh EBT.” The Healthify app provides members with an index of geo-located community resources to enable members to better access services that help them meet their basic needs. Fresh EBT is a food budgeting app that allows members to track their electronic SNAP benefit budget (known as the Electronic Benefits Transfer or “EBT”), find places that accept EBT and access healthy recipes. According to United, 55 percent of Fresh EBT users reported their benefits lasted longer, 92 percent found a new location that takes EBT and 68 percent reported making at least one change in dietary habits. 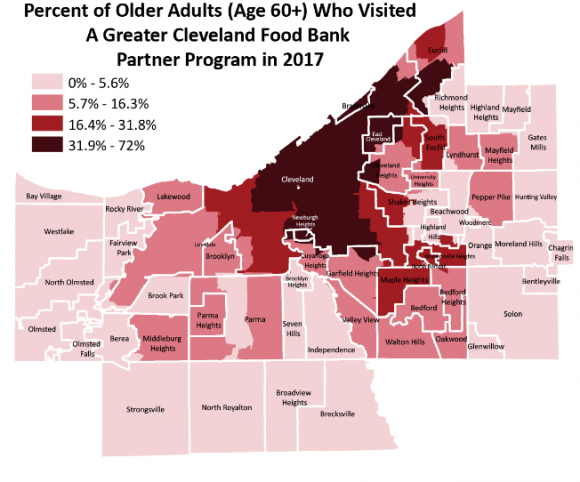 Another MCO, Molina, has also recognized these benefits in addressing food insecurity, recently partnering with pantries in Cleveland and Canton to distribute meals. While these two examples show an active effort by MCOs to address the nutritional needs of members, Paramount Advantage may have the most dynamic food insecurity program by an MCO in Ohio. Paramount Advantage is offered by Paramount Health Insurance, a health plan owned by ProMedica, a regional health system headquartered in Toledo. ProMedica has made a system-wide commitment, including the MCO, to address food insecurity as a health issue in the communities it serves and has developed a complex, integrative program to connect providers, case management, food distribution and data. As a part of a comprehensive approach in addressing the social determinants of health, ProMedica providers screen all patients to determine if individuals may be food insecure. Patients that are found to be food insecure are referred to one of two prescription food clinics where patients can select healthy food options for their household. Patients can visit the food clinic once a month for up to six months before needing another prescription. The food itself comes at no cost to the patient and they are linked to other services such as financial counseling. Through 2017, more than 500,000 individuals have been screened for food insecurity, with nearly 51,000 referrals to the food clinic program. While this program is new, the design and implementation have a heavy focus on data, process, and system integration. Patients that are found to be food insecure are referred to one of two prescription food clinics where patients can select healthy food options for their household. The process of screening adoption was enterprise-wide and done with an eye toward provider engagement, creating feedback loops so clinicians can see the impact of the new workflow. This type of clinical integration has been shown to create greater physician buy-in and organizational success in implementing hospital-based operational reforms. Providers are also required to enter the results from the screening tool into the electronic health record system and, importantly, the process leverages the use of Z-Codes from ICD-10  to manage the “after care” services offered. Z codes are billing codes that capture socioeconomic conditions which may influence a patient’s health status. While these codes are not currently reimbursable through Medicaid, and would require considerable policy definition before they could be become useful more broadly, they have a tremendous potential to impact the ways in which plans, providers and Medicaid programs, manage population health. These codes can document the non-clinical needs, and subsequent case management activities, within clinical and claims databases, simultaneously. While this program is relatively new, initial data suggests reforms have reduced emergency department utilization, increased primary care utilization and cut readmission rates in half. Food insecurity has a causal link to poor outcomes in health care for all Medicaid populations and, when properly addressed, can improve health outcomes, stabilize the economics of households, lower costs in Medicaid and prevent unnecessary care. A number of states are innovating by leveraging Medicaid’s systems and policy infrastructure to connect the disparate delivery systems of food and health care. These efforts include, but are not limited to, health and food insecurity data integration, the public indexing of community resources and policies, including demonstration waivers, which can affect the payment of providers and insurance plans. Ohio has recognized this connection but has not developed a comprehensive policy to address the needs of the food insecure. In fact, Ohio’s policy restricting access to food through work requirements is increasing food insecurity, which is likely to increase Medicaid costs and continue Ohio’s poor achievement in chronic disease management. While Ohio Medicaid policy solutions to food insecurity are currently lacking a cohesive strategy, there are some examples of innovation by MCOs. The spectrum of this innovation ranges from general distribution events, to more complex system integrations through data and clinical alignment. Notably, ProMedica’s example should be better understood to evaluate the adoption of Z-Codes as a tool in addressing social determinants. The Ohio Department of Medicaid should also consider the recommendations from HPIO’s 2017 Dashboard, and consider establishing food insecurity measures in its Pay for Performance contracting provisions with MCOs. Beyond these policy solutions, health systems across the state should look to local partners and community-based organizations to develop a network of resources that commonly case manage the social needs of patients. Organizations based in Cuyahoga County, for example, should access current tools such as the Cuyahoga County Board of Health Neighborhood Profiles, which index food resources by neighborhood. Without a comprehensive effort on both the local and state levels, Medicaid costs and outcomes associated with food insecurity in Ohio will continue to underperform. Fischer, Sally. 20 Feb. 2018. Sommerfeld, Kate, Plummer, Chloe. 2 March. 2018. ICD-10 is the international Classification of Diseases, a diagnostic tool for epidemiology and clinical management used to manage health care, monitor outcomes, and allocate resources. Gottlieb, Laura, et al. “Integrating Social and Medical Data to Improve Population Health: Opportunities and Barriers.” Health Affairs, vol. 35, no. 11, Nov. 2016, pp. 2116–2123.